At Peter Thiel’s invitation-only “Breakthrough Philanthropy” event in San Francisco on December 7, which brought together Silicon Valley’s top entrepreneurs with eight of the most visionary non-profits, Patri Friedman, grandson of legendary economist Milton Friedman, presented one of the most radical, imaginative concepts I’ve heard in some time. Here’s the text of his four-minute talk (video below — other Breakthrough Philanthropy speaker videos here). Every year, our phones get smarter, our cars safer, and our medical treatments more advanced. We all benefit from startups and established companies competing through constant innovation. So why is it that in one of the most advanced countries in the world, we’re still using the legal technology … of 1787? I mean, if you drove a car from 1787, it would be a horse! Surely some of the advances of the last two centuries have enabled new , better forms of government. For example, America’s founders were brilliant, but they couldn’t design a political system using the Internet, because it didn’t exist then. Now for humanity, this is a huge problem, but with our entrepreneur hats on, what a business opportunity! A startup country could be the world’s first trillion dollar business. But right now, there’s no way for an entrepreneur with a great idea for a startup country to make it happen. Unlike the software industry, where you can get started with just a laptop, to enter the government industry, you need a open space, a physical place that allows political experiments. But there is no such place — every piece of land in the world is claimed. So there are no startup countries, there’s no channel for innovation of entrepreneurs … no wonder it’s a such a sad industry. So why don’t we see more innovation in politics? Now, politics is a pretty emotionally charged subject. You’re not supposed to talk about that, or religion. So let’s take a new perspective. Let’s forget about left and right and instead, put on our entrepreneur hats. Let’s think of government as an industry, where countries are firms and citizens are customers. This is not just any industry. This is the world’s biggest industry. The leading firm had 2009 revenues of 2.5 trillion dollars. Strangely, it’s also an industry legendary for poor performance. That leading firm lost 1.4 trillion. And that’s a top company. The worst companies kill many of their own customers. It’s a pretty sad industry! So that’s how we come to seasteading — homesteading the high seas. What we need is a new frontier, an open space for political experiments…and the next frontier is the ocean. With a little technical innovation to make this new frontier accessible, we can unleash enormous political innovation. Let a thousand nations bloom on the high seas, trying diverse political systems — essentially, a startup sector for government. And of course, you don’t have to go out there to benefit. The best discoveries of these startups, like in any industry, will be copied by the market leaders — the countries of today. We think seasteading will begin in 3–10 years on ships, repurposed for businesses like medical tourism. In a decade, they’ll progress to innovative designs based on oil rigs, hosting a range of businesses and thousands of residents. And in several decades, they’ll evolve into true floating cities for millions of people, pioneering new ways to live together. Sounds like science fiction, but as Christine [Peterson] said, after 25 years, science fiction can become fact. It’s an incredible vision, and it’s urgent that we get these experiments started as soon as possible. We can already see that existing political systems are straining to cope with the realities of the 21st century. We need to find the next generation of governance technologies.We need to find banking systems that can handle inevitable financial crises; medical regulations that protect people…without retarding innovation; democracies that ensure our representatives truly represent us. Humanity needs seasteading…and seasteading needs you. We need experienced entrepreneurs who can join us in bringing the Silicon Valley spirit of innovation to where it’s most sorely needed. As of December 2010, the institute has raised more than $1,000,000, with funding led by Silicon Valley investor Peter Thiel, co-founder of PayPal and first investor in Facebook. 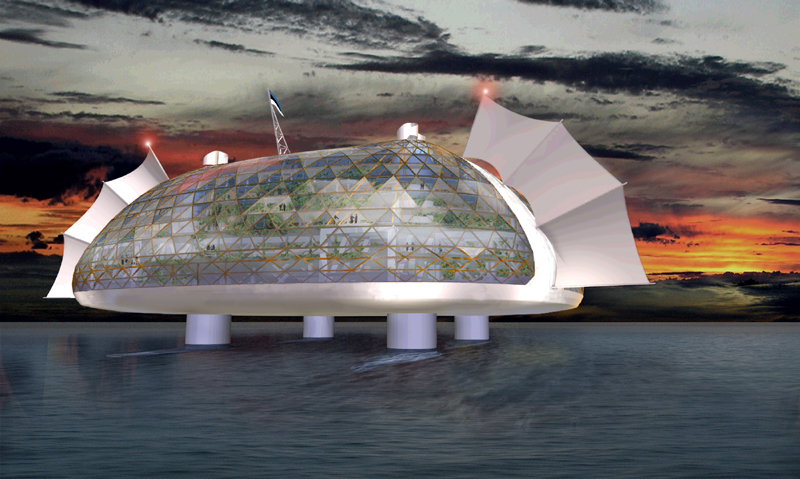 The nonprofit institute’s mission is to “further the long-term growth of the seasteading movement.” Its current focus is on “enabling the success of the first seasteads by researching the critical engineering, legal, and business problems, increasing public awareness, and building a core seasteading community. Interested in getting involved? Check out Seasteading Institute jobs and internships (“We’re looking for brilliant young students who are passionate about seasteading, fun to work with, and have a stellar track record of independence and accomplishment, and who are excited at the idea of taking on a high degree of ownership and responsibility. Our internships are custom-designed to meet each individual’s interests and skill set.”). You can keep up with the latest seasteading news via numerous online channels or contribute through the Membership Program.